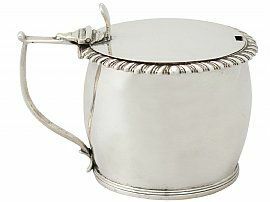 This fine antique William IV Irish sterling silver mustard pot has a plain barrel shaped form onto an applied collet style foot. The plain body of this piece is ornamented with a bright cut engraved crest of a demi-griffin holding between the claws a mullet. The upper rim is embellished with an impressive applied gadroon decorated border. This fine antique mustard pot is fitted with a hallmarked hinged cover surmounted with a plain shaped thumbpiece. This piece has a plain angular sterling silver handle featuring a plain thumbpiece. 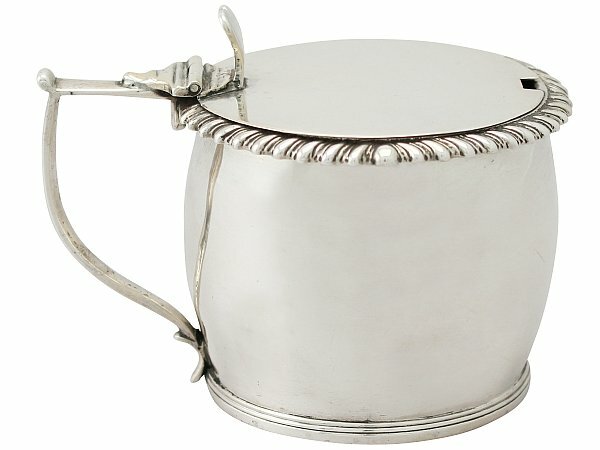 This William IV mustard pot can be supplied with an appropriate sterling silver mustard spoon upon request. This antique mustard pot is a very good gauge of silver, fine quality and in excellent presentation condition. The applied decoration is very sharp and the bright cut engraved crest is crisp. Full hallmarks struck to the surface of the body are very clear; the hallmarks to this piece are very clear considering their location. Reflections in photographs may detract from the true representation of this piece of William IV silverware. Height to top of thumbpiece 7.8cm/3.1"